We brush them, we tweeze them, we pencil them in. We spend a lot of time getting them just how we want them. Our eyebrows are important to us. Eyebrows define the face like no other feature. Although losing your eyebrow hair can be very upsetting and disappointing, there are several ways to recapture your look. One of the most popular ways to recreate your eyebrows is with makeup. There are many other options to achieve beautiful eyebrows. Keep reading to decide which one is right for you. Drawing the perfect eyebrow doesn't have to be difficult. With our easy to follow instructions, you will be drawing perfect eyebrows with makeup in no time! For best results, we recommend using this Indelible Eyebrow Pencil. It's our personal favorite because it is easy to use and long lasting. It also comes with an eyebrow brush on the end, which allows you to feather out your look. To draw natural looking eyebrows, it's important to determine where your eyebrow starts and ends. This guide will walk you through the process. Before applying our Indelible Eyebrow Makeup Pencil, clean the skin surface. (If you have oily skin we recommend using alcohol). Draw an imaginary line from the outside corner of your nose to the inside corner of your eye as shown in step (A) of the illustration. Place a small dot with your pencil on the imaginary line where it crosses the brow bone. Your dot should be just underneath the letter (A) in the illustration. 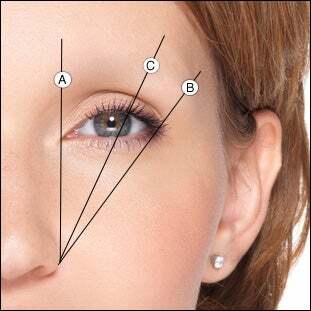 Starting from the outside corner of your nose to the outside corner of your eye, place a small dot on the imaginary line (B) where it crosses the brow bone. From the outside corner of your nose to the outer rim of the pupil, place a small dot on the imaginary line (C), slightly above (A), where it crosses the brow bone. This will be the best position for your eyebrow arch and where the highest part of your eyebrow should be. 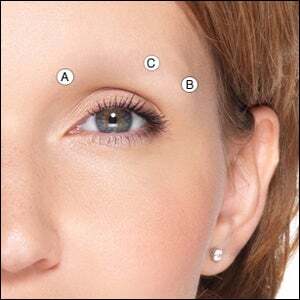 Starting from the outside corner of your nose to the outside corner of your eye, place a small dot on the imaginary line (B) where it crosses the brow bone. From the outside corner of your nose to the outer rim of the pupil, place a small dot on the imaginary line (C), slightly above (A), where it crosses the brow bone. This will be the best position for your eyebrow arch and where the highest part of your eyebrow should be. Following this guide, you now have a very basic eyebrow shape. Underneath (A), (B) and (C), you should have 3 small guideline dots drawn with your eyebrow pencil. Using your eyebrow pencil, connect the dots by drawing a brow that is thicker between (A) and (C) and a thinner between (C) and (B). Use thin, feathery strokes for the most natural look. After drawing your eyebrow line, use the brush on the end of our Indelible Eyebrow Pencil to create the effect of small hair-like strokes. This will give your eyebrows a realistic and natural looking appearance. Once you have found the proper placement for your eyebrows, drawing them on and achieving a natural look is easy! With a little practice, you will be drawing your eyebrows like an expert in no time. We do offer several tools that will allow you to recreate a natural looking eyebrow with makeup. The benefit of using cosmetics to recreate an eyebrow is that you can customize the color and shape exactly as you wish. The con is that some women need to experiment and learn to apply them in order to get the best result. We offer two types of stencils that will allow you to draw the perfect shape and arch when recreating your eyebrows. Both of these stencil options will allow you to draw flawless, symmetrical brows in the shape that you wish. Peel and Stick Eyebrow Stencils: To use these, peel off the desired stencil and position where your natural eyebrow should be. Use either an eyebrow pencil or powder to fill in the stencil. Six eyebrows come in a set and each one is reusable and hypo-allergenic. Eyebrow Stencil Set: To use these stencils, hold the stencil in place and if using an eyebrow pencil, lightly trace the outline of the stencil. Once traced, remove the stencil and fill in the outline using short, quick strokes for the most natural look. If using eyebrow powder, hold the stencil in place and fill in using the brow brush. This stencil set comes in a set of three which includes fine, medium and full. All three are reusable and can be easily cleaned. These stencils are versatile because they can also be used to maintain existing eyebrow shapes. After finishing the desired eyebrow shape using either a pencil or powder, remove the stencil and tweeze away any undesired stray hairs from outside of the shaded area. Indelible Eyebrow Pencil: This versatile eyebrow pencil is long lasting and easy to use. It does not require a sharpener for use. 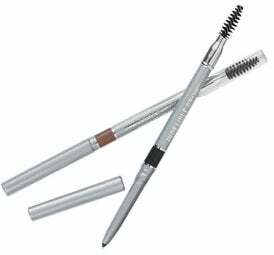 The tip features an eyebrow brush which can be used to soften the eyebrow lines created, or used to tame existing eyebrows. Use alone or in combination with an eyebrow powder for additional dimension. This eyebrow pencil is an essential tool when drawing your eyebrows. Eyebrow Powder: Our powders come in a variety of colors and can easily be used to recreate an eyebrow. Use alone, or in combination with our eyebrow pencil for additional dimension. Eyebrow Kit: This kit comes with an eyebrow powder, an eyebrow brush, eyebrow stencils and eyebrow gel to seal the eyebrows after applying. This complete kit will allow you to draw your eyebrows like a pro. If you don't want to draw your eyebrows, our temporary eyebrow tattoos might be ideal for you. Our semi-permanent tattoos are transferred from the printed paper onto your skin in 60 seconds using only a wet cloth. Once applied, they are waterproof and can last up to 2-3 days. They can be easily removed with makeup pads or baby oil. Our eyebrow tattoos come on sheets with several pair per sheet. Pros: Economical, easy to apply, available in several shapes and colors. Nontoxic and made from pure vegetable dyes. Cons: The length of wear may also vary from person to person. This is due to fluctuations in body temperature, hormone levels, and oil secretions from the facial skin. Since menopause alters hormone levels, women going through menopause may find that the eyebrow tattoos do not adhere as well as they once did. Usually, the issue subsides over time. If the problem persists, our Human Hair Eyebrows may be a better option for you. Another alternative to drawing your eyebrows is our Stick On Eyebrows. These brows are incredibly convincing! Real human hair is hand placed into a clear gel backing. The eyebrows are applied by administering adhesive to the clear backing, aligning them on the face and pressing firmly until secure. Many of our customers are able to wear the eyebrows for at least two consecutive days without them having to be reapplied. Our customers report an average of 3-4 months of wear from one pair of eyebrows, with proper care. Pros: The most natural look possible. The only option that allows for a 3-D effect, giving the real texture of human hair eyebrows. Cons: More expensive than other options. The Realistic Eyebrows are hand made out of 100% human hair. Therefore, slight variations do occur. These variations allow for a more realistic look, as natural eyebrows are not identical. See our Frequently Asked Questions Page for more information about our Realistic Stick On Eyebrow Wigs. Eyebrow makeup is an invaluable tool because it allows you to alter your brows to perfectly flatter and fit your face. It can also make false eyebrows look more realistic. If you buy a pair of eyebrows that don't look quite right on you, a little makeup may be all you need to “cinderella” them. Here are some ways you can use makeup to make your eyebrows impeccable. The eyebrow tattoos can sometimes give off a shiny effect; you can rectify this side effect in a snap with eyebrow powder. Simply brush eyebrow powder in short ticks on top of the tattoo with a brow brush. You can also use a spoolie brush to soften the look of the powder. Adding powder will also give the brows depth and create a more realistic look. Swipe a small amount of translucent setting powder over the brow to ensure the makeup lasts all day and remove any remaining shininess. If you don't want to go through the process of applying eyebrow powder, a bit of translucent powder on top of the brow area will also eliminate shininess. You may find that the shape or volume of your eyebrows is not quite what you wanted. Fortunately, you can use eyebrow powder and brow pencils to give the eyebrows a different look.If you think the brows are too short, you can use an eyebrow pencil and extend the length of the tail by making short strokes at the end of the brow. If the brows are not full enough, you can fill them in using the same short ticks. When you do use makeup to alter your eyebrows, make sure that you blend the makeup throughout the eyebrow; if you don't, you may end up with a bandaid effect which will take away from the realism of the brows. To do this, make several short strokes randomly throughout the brows and use a spooly brush to blend and voila! Perfect brows in an instant! Was this resource helpful? Please let us know by posting your comments and questions below. ©2000-2017, Headcovers Unlimited, Inc., All Rights Reserved.